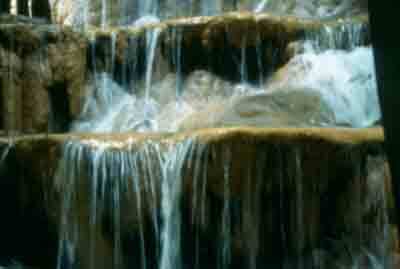 Flowstone is created when water saturated with limestone particulates evaporates. (Particulates are microscopic granules of rock so small they are either bonded to, or suspended between water molecules.) When the water evaporates, it leaves molecules of particulate on the base rock, eventually forming a stalactite or "waterfall." You can see small delicate "soda straw" stalactites forming over yourhead everywhere. Look closely-they are hollow, therefore the name "soda straws"
Flowstone waterfalls existall across Thailand, both incaves and above ground.Karst island "waterfalls" haveshort drainage systems. Unlike tbis stream-fed flowstone,island flowstone is starved forwater and grows more slowly. straw" where the water drop breaks off the water column. As mentioned, flowstone also gives the islands their many different colors. When the islands were lower, minerals like iron flowed down the rivers and were deposited in the limestone cracks. After the islands rose, percolation dissolved the minerals,staining the rocks as mineral-saturated rainwater flowed downhill. Different minerals create different colors. In Ha Long Bay, Vietnam, lignite coal gives the islands a dark gray appearance, with only a few red stains. 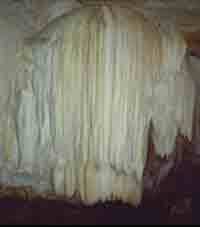 Stalactites are by far the most amazing cave decorations. They seem to hang down from cave ceilings, exterior cliffs, and overhangs. Every time you see a stalactite, there's a water source flowing above, rain that dripped down through the entire island. Never touch a cave decoration. They are always delicate. Even the oil from your fingertip will change the flow of water across their surface, perhaps changing their growth for eons. It doesn't make sense to take souvenirs either. Cave decorations are never as colorful outside a cave as they are in their natural setting. 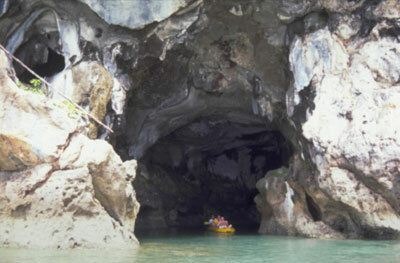 Limestone caves are so fragile that SeaCanoe will never commercialize a drycave. However, with a trained guide ina sea kayak, non-impact, low volume caveentries are possible because they don't require permanent lights or footpaths. Even body heat is carried out of the caves by the winds and changing tides running through tidal sea caves. Most marine napes are created by surf pounding cliffs, but Phang Nga has no surf. These napes were made by tidal action, so relentless that the overhangs can extend out ten meters and more. Napes are most obvious at the north point of Koh Panak, which catches dropping tides head on. Napes at two sea levels eroded "together", creating a ceiling far above high tide, supporting large stalactites that started growing when the first nape was formed-about 20,000 years ago. of earth. 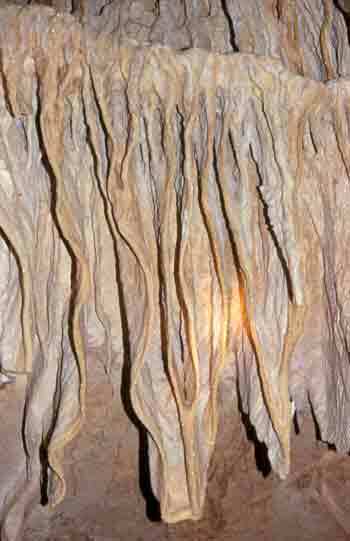 In large land masses, holes can form in cave roofs leading to collapsed caverns. But Phang Nga's islands aren't big enough to form mature drainage systems,so in a small land mass like an island, an inverted cone shaped like a coffee filter fills with rubble as it percolates away. near the entrance. The mud bank at the entrance is almost two decimeters (8 inches) lower than the mud bank at the back of the second Hong. All sea caves are fascinating. When the tumultuous surf inside California and Hawai'i sea caves combines with echoing sound effects, it is certainly exciting. Although Asia's tidal sea caves seem sedate, they are packed with flowstone and backed by Garden of Edens called "Hongs." Traversing these oyster-filled cavities can be quite dangerous on Spring tides if your guide doesn't know what he's doing (Ours do!). Each time the tide changes, it eats a few molecules from the limestone. Naturally, the water works into cracks (faults) in the rocks, eating them wider and deeper with each tidal change. 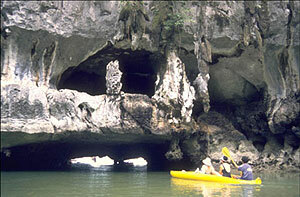 Not only are Asia's caves beautiful, they can be much deeper than surf caves. 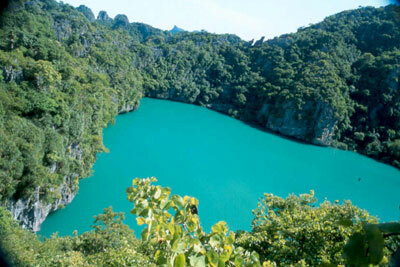 Thailand has a 2K cave in the Far South, and Halong Bay has a 3K sea cave. When sea waters follow a fault line to meet up with standing water in a dolite, a Hong begins to form. The tides eat away the rubble and create a nape, which gradually shears the cliffs away until they are vertical, turning the coffee filter into a cylinder. A Hong is born. The walls of the Hong are a limestone donut. By our definition, cliffs must meet in an unbroken circle to qualify as a true Hong. Percolation runs down the same fault line that allows the tidal cave, creating decorations and eating away at the cave ceiling. Even so, ceilings are basically at the highest tide level. Mud/rock/oyster fragment cave floors generally fill up to mid-range tide levels. 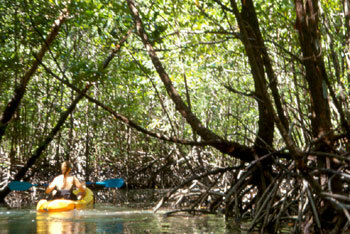 Mangroves are sparse in Phang Nga's islands, although coastal mud flats are carpeted with green. The Mangrove Hong was named because of it's thick forests, but over-volume created by destructive group tours seriously reduced the Mangrove Hong's population by 75%. 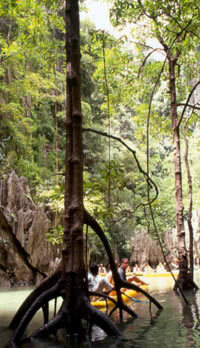 One species near the cave entrance disappeared entirely because other operators allowed guests to climb and break the trees, and ran their kayaks over the seedlings. 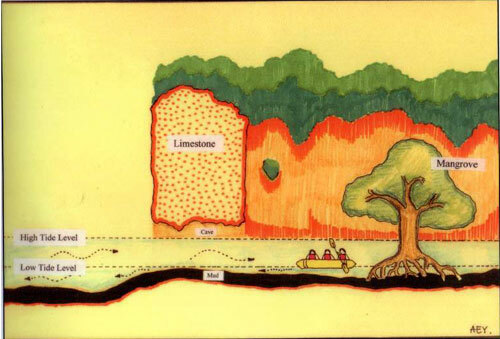 "Forests of the Sea", mangroves literally create the swamps where marine life eventually crawled onto land. Mangroves' water-born seeds range between the Tropics, creating sanctuary for young life from both land and sea, and creating new land in the process. All mangroves need is still sea water.Mangroves are unique because they live in salt water, which means the water level and salinity changes with the tides. 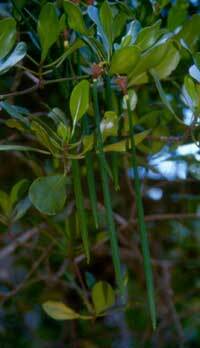 Their distinctive stilt roots keep them upright, and they secrete salt through their succulent leaves. Stilt roots develop and hold together coastal flats, but theseeds cannot take root in channels or swift moving water.We don't have large mangrove swamps on this trip, but on some of the other trips we stop in the mangroves and sit perfectly still for a few minutes. Mangroves come to life with crabs, insects, birds and macaques, not to mention life in the muddy waters from plankton to small fish.